The Widmer Amano TS 3000i A155 "Ethernet" Time Stamp saves time and money. 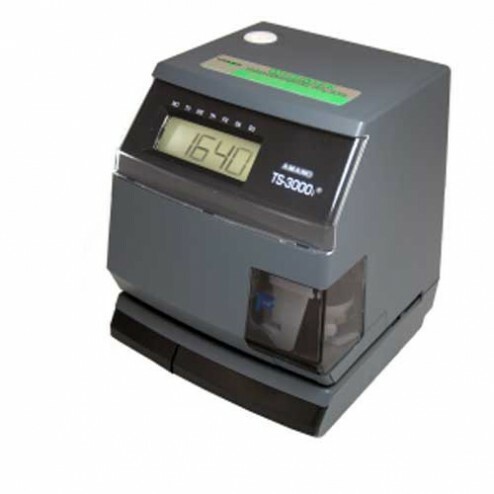 The TS-3000i is a turn-key web based clock that provides users with automatic time synchronization for valid time. this clock will run on its own, utilizing easy-to-use time synchronization scheduled with a backup system that sends email notifications and SNMP trap alerts. the clock generates reports on time sync events for use during an audit. E-mail notification of clock status and/or failure to synchronize the time, which is configurable to send e-mail notification to chosen recipients. Print individual reports via web browser or centralized reporting via TS-3000i Utility software. Event notification through SNMP traps. This feature enables network administrators to centrally manage time clocks performance, locate problems and solve them in a timely manner. Clock monitoring which displays on-line and off-line clocks, and provides email of off-line clocks.